Bearing Drift Blocked Me and Deleted My Comments for Calling Out their Dishonest Post. What a Bunch of Children. | Virginia Right! Bearing Drift put up a post accusing Eric Cantor’s opponent Dave Brat of failing to file his financial disclosure forms on time. He filed for an extension and that deadline has passed. That much is true. But as it turns out, he really didn’t need the extension because the forms are not actually due until May 9th. 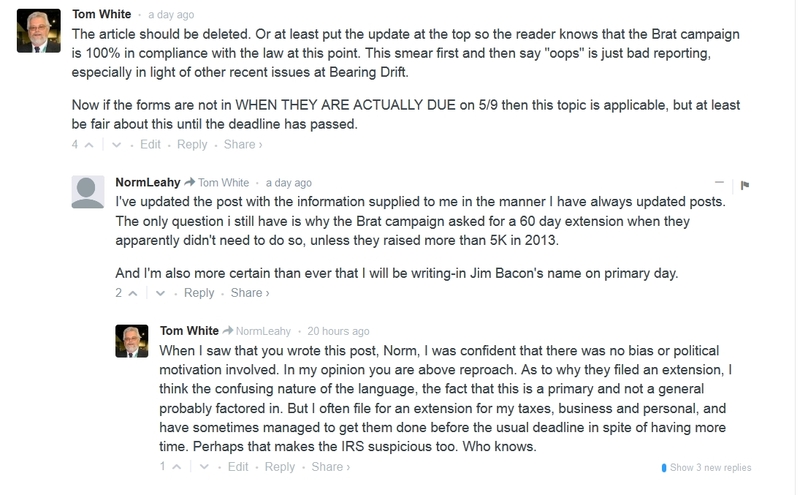 Now the post was written by Norm Leahy who is the only person currently writing for Bearing Drift that has an opinion I consider worth reading in light of the recent last minute disclosure of financial dealings with the Cantor campaign by several of the folks who write for Bearing Drift. And while they claim there is no pay for play going on and no money changed hands for favorable or unfavorable posts, that, to me, is not the point. It is my opinion that Bearing Drift has indeed drifted in their opinion. So much so that I no longer read their blog. It is simply irrelevant to me. Unless they publish something that is not correct. Which is the case here. Now Leahy did post an update agreeing that the forms are not late after being contacted by the Brat campaign. But I believe that a correction that invalidates an entire post should be placed at the beginning so as not to first give a reader false information then say it is not true. Or better yet, strike the entire post. And I expressed my opinion in the comments section yesterday after a reader pointed out that Bearing Drift had posted an incorrect statement. And here is that exchange – which has now been deleted. So, is this a reasonable and adult response, or am I somehow shilling for Dave Brat as Brian Schoeneman accuses me of doing? My email alerted me that there was a response to my comment from Schoeneman, which follows, as well as my attempt to respond to his immature comment. But apparently, Schoeneman threw a temper tantrum and blocked me. Well, like I said, I find nothing of any substance at Bearing Drift anymore and no longer bother to visit the blog that, in my opinion, has adopted many of the same reporting tactics used by MSNBC and the “control the message” complex of the Obama administration. The only question I have left is why Norm is still associating with these guys who are no longer about open dialog and any opinion but their own. And that is a real pity. I used to enjoy reading the old Bearing Drift. And for the record, no one at Virginia Right! is taking a dime from any politician. Our opinions are our own and are not tainted with money in any way. We make no profit and are in this for betterment of the nation. Money and profit are not even in the picture. The little money I receive from the ads on this site do not even come close to paying for the dedicated server I am paying for. That comes completely out of my pocket. And if you want a true Conservative opinion, check here or I would also suggest The Bull Elephant. ← Dave Brat on Mark Levin TONIGHT!!! At less Tom has a site to post the true nature of the politics in VA. During the Governors race last year I know so many people who was banded from sites and groups for questioning the Republican Party of Virginia. No matter how polite and courteous you were in your post they banned you from their sites when you question them on policies. Everyone on these sites is like minded and has to agree with the Republican party lines or your out of here. Well, this independent found a home with the Libertarians in that election. The Republican party left me, the Democrats never had me. The two party system is a monster that keeps feeding on the American people and their freedoms! You would be surprised how many higher ups in RPV agree with you. One said to me yesterday “I just don’t know what they’re thinking over there at Bearing Drift”. We agreed that it was once an excellent blog but that is no longer true. I still like Norm Leahy, he’s a reasonable man and a very good writer. Too bad he’s stuck on that blog. I was banned from Bearing Drift months ago and yet they still call me names, racist and nativist, to mention two of many of the epitaphs that they hurl at me. You were so right when you suggested that the children over there need to grow up. There are many people who agree with you! Sorry happened, Brian S. has jumped the shark. BD used to be a good site. It’s really sad to see what’s happened to that blog, and especially the umpteenth demonstration of how establishment “moderates” behave. Well, whatever they are doing isn’t it working for them? Just last week, wasn’t Comstock anointed into their club? Tom, do you think “they” are going to embrace you for what Va. Right has, and is doing? Dude, you are either on the train or on the tracks. There is no in between with either Party. Remember this Tom, the “Fluvanna County Vatican” doesn’t take prisoners. Haven’t they convinced you all that Medicaid expansion is BAD, VERY BAD? Did they tell you how Medicaid for the uninsured is handled in Virginia now? NO. So let me break the news to you. This is a simplified explanation. The Legislature now takes hundreds of millions, or billions of dollars, gives it to the providers, and tells them to take care of the uninsured. Let the providers decide who gets treated for what, and when. Whatever is left over, they, the providers, basically get to keep. Stick in their pockets. The less they spend on care, the more profit they make. All legal. So, the less the providers spend on the uninsured, the more the providers put in their pockets. Now, guess what the providers do with some of this taxpayer bounty to ensure that the flow of your money to them is not interrupted? Seems it has a habit of ending up in political PAC’s and as campaign donations. They have thousands of lobbyists to fertilize and grow this source of income. All legal mind you. The politicians and providers do NOT want to be held accountable for billing for each individual uninsured patient. They would rather take the cash and doll out treatment as they see fit. Does this lead to half-assed care only when they cannot get out of it? How can “they” be charged with fraud when the whole program is nothing but a fraud? A legalized fraud. So, there you have it , what “they” do not want you to know! The way to stop the Republicans? Vote Democrat. You are sooo funny! You always seem to overlook the fact that the Democrats you are so enamored with have run up almost $9 Trillion of Nat’l Debt in the last 6 years alone w/ their vote buying schemes. However, you do make an excellent case as to why Health Care should never be run by the gov’t in any capacity b/c they always bankrupt it! 10. If you can’t wait for college football season to be delayed or cancelled because the student athletes are union employees. 9. If you believe oil companies’ profits of 4% on a gallon of gas are obscene, but the government taxing that same gallon of gas at 15% isn’t. 8. If you believe the government will do a better job of spending your money than you will. 7. If you believe Freedom of Speech critically important, as long as nobody is offended by it. 6. If you believe regular citizens are way too irresponsible to own guns, and know that your local police are all that’s needed to protect us from murderers and thieves. You are also thankful that we have a 911 service that get police to your loved one’s home in order to identify their body after a home invasion. 5. If you’re not concerned about millions of babies being aborted, but are passionate about keeping death row inmates alive and comfy. 4. If you think illegal aliens have a right to free health care, education, and Social Security benefits; and that we should take away the Social Security from those who paid into it. 3. If you believe that businesses should NOT be allowed to make profits for themselves. You also believe that they should break even and give any excess to the government for redistribution and fairness, as elected officials and public servants see fit. 2. If you believe judges should rewrite the Constitution as needed to suit those whose agendas would never get past the voters. 1. You think that it’s better to pay billions for oil to people who hate us, but not drill our own because it might upset some endangered beetle, gopher, fish or frog. On the other hand, if you now have a headache from reading this list, you probably should not be voting Democrat. This guy Schoeneman’s credibility is barely running on fumes anymore. Be Done w/ Bearing Adrift! For me and mine……………. http://www.VaRight.com and http://www.BullElephant.com are the only way to go anymore, adieus BD. Thank you for reading http://thebullelephant.com/. We’re working hard to bring you Virginia news and we don’t ban people! I wonder how many more people Bearing Drift has banned? I thought only democrat blogs did that until Bearing Drift began doing it with some frequency. It was once such a good blog but those in charge for the last couple of years have ruined it. I had hoped that with JR Hoeft back in charge things might change for the better but with Brian S. continuing to ban people, it looks like that won’t happen. Thanks for the good word, Tom! Well, there goes the exclusive BD paying gig to write on UKIP daily! 🙂 Rather stay at Virginia Right! Elwood “Sandy” Sanders recently posted…LABOURITES have LITTERED the UKIP facebook page with why they are defecting to UKIP!